Salads of all sorts get me feeling light and fresh and nourished so I make them all the time. They are also capable of dazzling my taste buds. I definitely love meat and potatoes and other things, but salads…you can do anything with a salad! I suppose it helps to love vegetables, but part of what makes them special is what you do to them. If you haven’t found a way to prepare cauliflower that you like yet, maybe just keep going! Or zucchini or broccoli or green beans. Keep trying different preparations and maybe you’ll discover that they’re pretty delicious after all. If you’re already a veggie-lover, then here’s another little something to throw together and serve with something grilled. 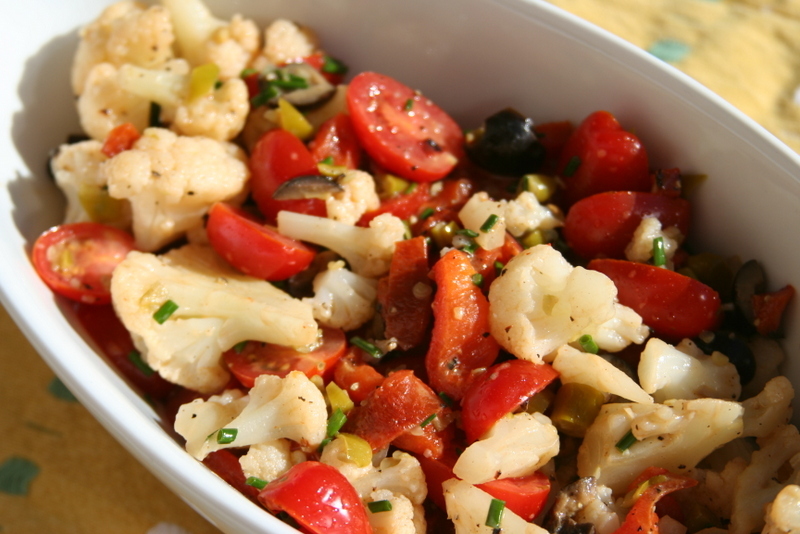 Crunch from the cauliflower, tender roasted peppers, a little kick from the sport peppers – yum! Steam the frozen cauliflower lightly (the instructions called for 6 1/2 minutes, I cooked it for 4 minutes). Drain and place in a large bowl. Slice the roasted bell pepper into strips and add to the cauliflower along with the halved cherry tomatoes, sliced olives, minced peppers, and chives. Sprinkle with a pinch of salt and pepper. Whisk all the dressing ingredients together in a small bowl and pour over the salad. Mix well, tossing until everything is coated. Allow the salad to rest in the fridge for 15 minutes or more so the flavors can meld. Adjust the seasonings with a little more salt and pepper if desired and enjoy!